Call centre, script written by the artist, direct dial telephone connection, telephone, desk, table, chair, cassette recorder and tapes, transcriptions of resulting conversations (ink on paper.) 2001. Commissioned by fig-1, London; funded by Film & Video Umbrella, London. The gallery contained a telephone on a desk. Picking up the receiver, the visitor was connected direct to a telephone call centre which was hired by the artist to ‘represent’ her. From a script written by the artist, the call centre agents answered with the artist’s name and the title of the work, and then offered the caller limited generic information about the artist, such as information on her past work, her CV or reviews of past shows. 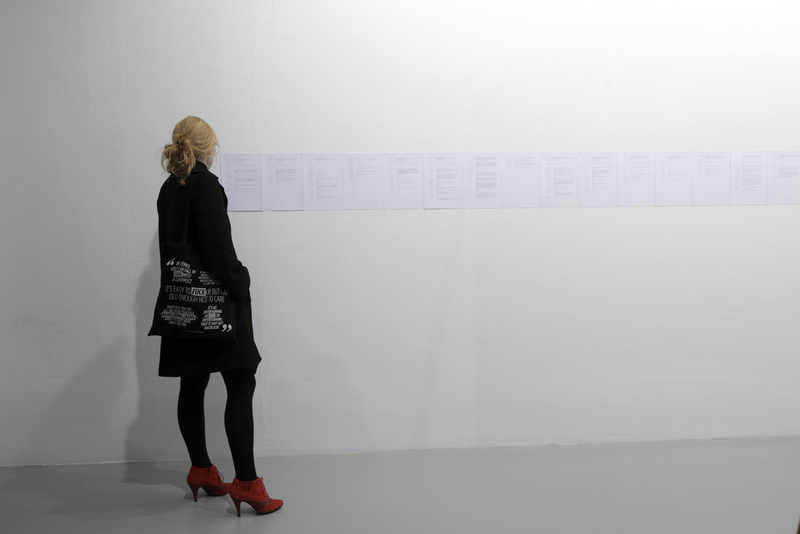 The conversations were recorded and transcribed and form the documentation of the piece, which has subsequently been exhibited in its own right on a number of occasions. From the documentation it is evident that the temptation for the callers to break out of the generic monotony proved irresistible for both parties. "In Nothing Ventured, Young chose to foreground exactly those representational and promotional energies associated with a 'white cube' gallery space by transferring the management and delivery of such activities onto the genericised business interface of a call centre. Here Young was not working with a representation of situations or processes, but self-reflexively, with the actual situation or process itself – that of promoting a show, artist, and career through the medium of a call centre. Young deployed the call centre as an ironically-positioned readymade. It is through irony that quotation gains a critical force. One speaks with two voices, establishing a kind of triangulation between the source of quotation, the quoter, and the receiver. Inflection is as much at play as ventriloquy when one taps into the authority of the quote. Young's use of irony here was twofold: the call-centre-as-readymade being a quasi-avant garde gesture in itself, but one which also referred to familiar themes - the dematerialisation of the art object and artistic identity. As a form of address, the call centre quotes from one of the most familiar 'interfaces' a consumer has with a business. Perhaps most significantly, Nothing Ventured evidenced the conditions of consumer attention shared in the reception of contemporary art and the market outreach of a service-based or 'information' economy."